For BioFach 2017, BIO PLANÈTE has come up with a real surprise: after 33 years as an expert in organic oils, for the first time the company will be presenting a whole new product range that strikes out in a new direction from its “liquid gold” – three high-quality plant-based protein flours for cooking and baking. The series comprises fine flaxseed flour made from native linseed, savory pumpkin seed flour made from roasted Austrian pumpkin seeds, and flavorsome walnut flour. Based on the flaxseed flour, BIO PLANÈTE has also developed a ready-made protein and fruit mix, “Breakfast Champion,” to round off the new range. Flour from the oil mill? Sure! Oils and flours have far more in common than you might think. The protein flours are made from the 100% natural, organic raw ingredients used when pressing oil. Once the oil has been obtained from these seeds and nuts, they are ground into a fine flour which makes a perfect protein-rich food supplement or a gluten-free flour substitute. All three products are vegan and high in fiber, as well as being rich in important minerals and trace elements such as iron, magnesium, zinc, manganese, folic acid and vitamin B6. BIO PLANÈTE has put all its longstanding expertise and knowledge about the different seeds, nuts and fruits and their processing into developing this new range. 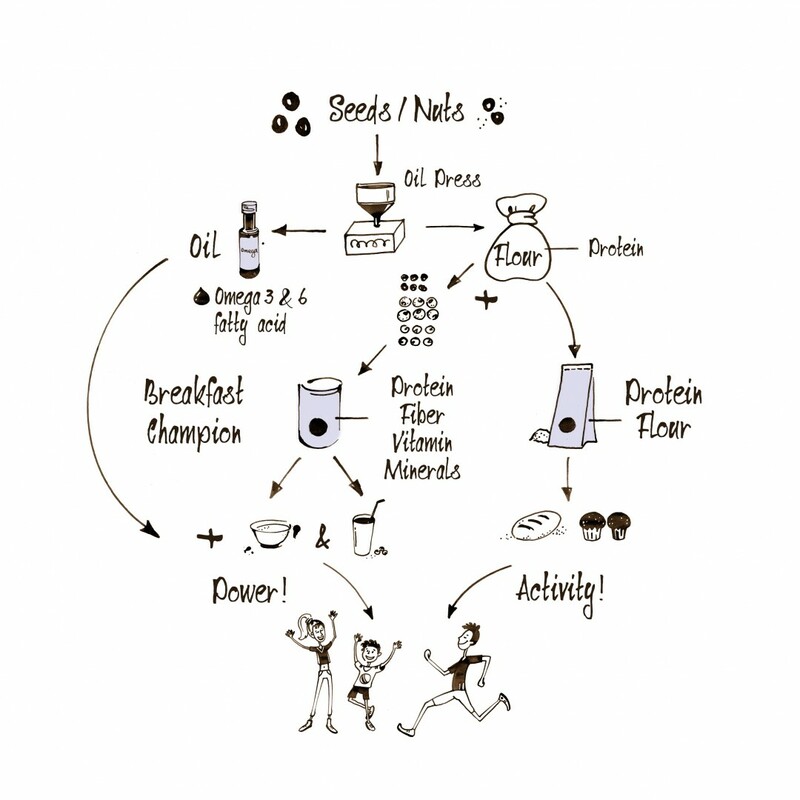 Just like with its oils, when making the protein flours the organic food pioneer follows the entire development process without a single compromise from the idea to the raw materials and on to the finished product. Thus, BIO PLANÈTE can guarantee these products’ outstanding high quality. Proteins are one of our main dietary components. Human beings require them every day, amongst other things to build muscles, organs and cells. 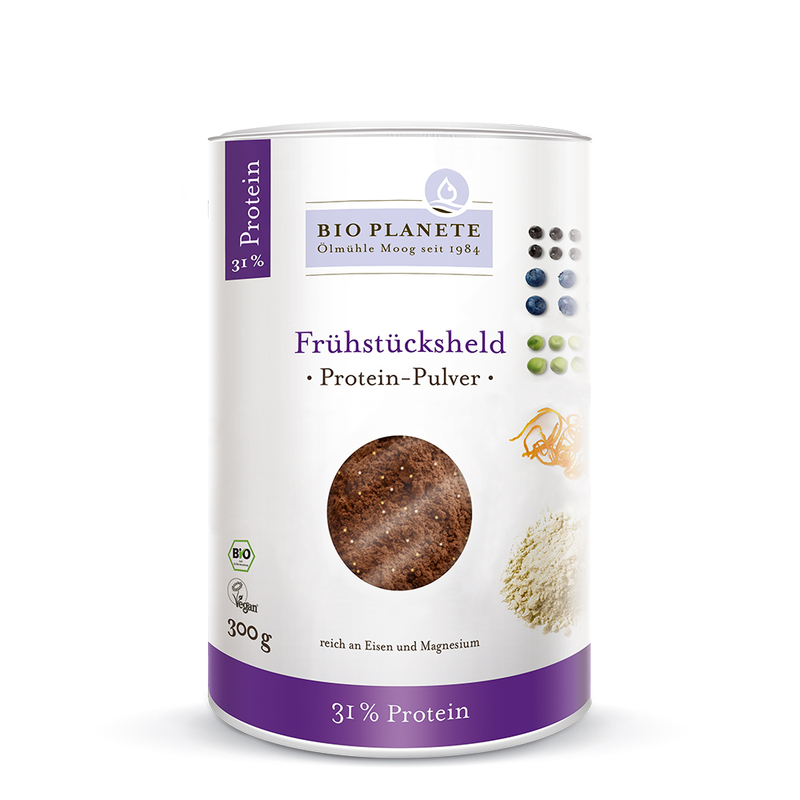 The BIO PLANÈTE flours are an extremely simple way to improve your daily protein intake, as they are exceptionally high in protein: the walnut flour provides 47 g of protein per 100 g, the flaxseed flour 33 g and the pumpkin seed flour a whole 59 g. That means the flours contain a lot more protein than chicken breast (22 g), chicken eggs (13 g) and milk with 1.5% fat (3.4 g)*. This makes the flours a perfect companion for the whole family, and especially people with high protein requirement, such as sportspeople, adolescents, pregnant women, senior’s citizens and vegans. 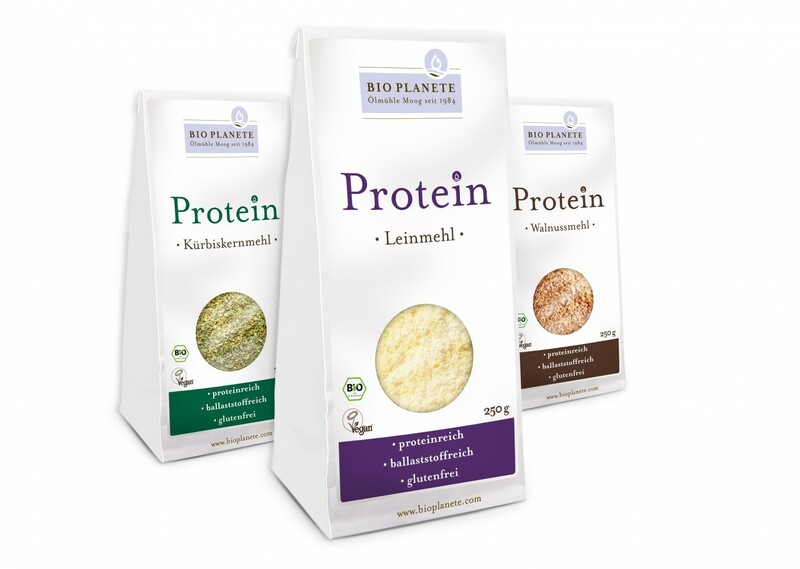 The BIO PLANÈTE protein flours have been developed for people who want to eat healthily and love cooking and baking; the three varieties can be brought into your everyday cuisine in a variety of ways. Whether preparing bread, cookies, cake, pizza or even dips, replacing some of the wheat flour with protein flour allows to raise the protein content of favorite recipes considerably. Replacing the flour entirely allows to cook and bake entirely gluten-free. From its wide range of nuts, seeds and fruits, BIO PLANÈTE selected ingredients with exceptional flavors for its new products: the pumpkin seed flour is extremely aromatic, the flaxseed flour makes the perfect base for sweet and savory recipes, and the walnut flour has a delicious nutty flavor. For further information and recipe ideas go here. All the protein flours are suitable for vegetarians and vegans; the walnut and flaxseed flour are even suitable for a raw food diet.